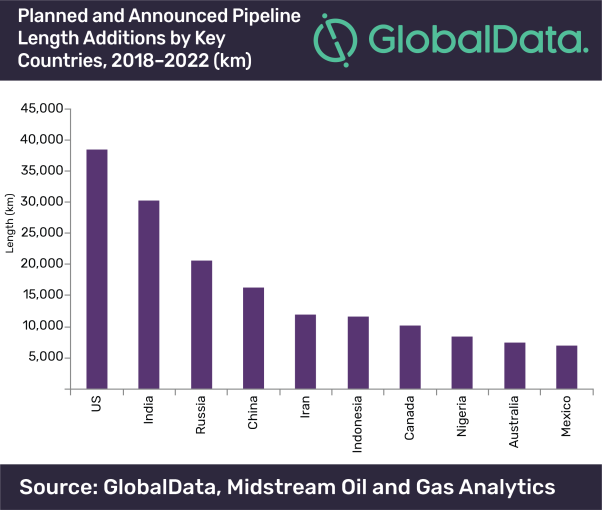 A total growth of 12.2% in length is expected in the global oil and gas trunk pipelines industry by 2022, according to GlobalData, a leading data and analytics company. The company's latest report, ‘H2 2018 Global Length and Capital Expenditure Outlook for Oil and Gas Pipelines – US Leads with Highest New-Build Pipeline Length Additions', reveals that, Asia leads globally in terms of oil and gas pipeline length additions with a total pipeline length of around 71,000 km with the region expected to have capital expenditure (capex) of nearly US$99 billion by 2022. Whilst North America will be second in total pipeline length with a little over 55,000 km, it will lead in terms of capex with US$164 billion to be invested over the next four years. The US, India, Russia, Iran, and China will together add around 117,000 km, which will constitute around 50% of the total trunk oil and gas pipeline length to be added globally by 2022. These countries are expected to spend a total of around US$253 billion on new build pipeline additions during the period. In terms of capex, Gazprom leads with the highest capex spending of around US$46 billion by 2022, China Petrochemical Corp stands second with US$33 billion, followed by TransCanada Corporation with US$24billion. Indian Oil Corporation Ltd will be the leading company, globally; with the highest trunk oil and gas pipeline length additions with 15,000 km. China National Petroleum Corporation and Gazprom follow next with new pipeline length additions of around 13,700 km and 13,500 km respectively.